Number five: Governor Chris Gregoire's re-election. She squeaked by challenger Dino Rossi - yet again, in a near mirror of their match-up in 2004. So a check of the Washington State Election site points out the results - Gregoire 53%, Rossi 47%. In a political sphere where getting a fraction of a percentage point over your opponent is considered a "mandate", I would hardly call it "Squeaking By". I would call it "Thumping around the head and shoulders", but then, that's just me. 2009 can't come soon enough. So the snow had melted (for the most part). At work, the slough is almost is over the banks, and several trees have been snapped. At home, the woodpecker continues its assault on the power pole. The garbage has yet to be picked up. The great Snowpocalypse of Late-Oh-Eight is done with. And to some degree, I'm going to miss it. The blanket of white, the lack of traffic, the solitude of it all. The fact that I could get out of the driveway with the chains and that, while a hike, the basic amenities were still available. We didn't go hungry, and my Christmas present to my parents got there on Christmas day. I'm not particularly cheesed about the lack of salt on the road, since my favorite first vehicle (A powder-blue Cutlass Supreme) lost its trunk and wheel wells to the relentless chemical erosion of salted streets in Indiana, Pennsylvania, and Wisconsin. And the fact that my own job could we worked from home for a couple days worked out well for us as well. I am less entertained by the failure of other urban services. I can give them the lack of garbage pickup on the week of the heavy snowfall, but after Christmas, when most of the roads are finally passable? The Lovely Bride do not product a humongus amount of trash, but we HAVE been entertaining, and the recycling bin is starting to be a two-person operation. And I am particularly cheesed about the performance of transit, ranging from buses to planes. A complete collapse of public transportation in the face of this mess is one of the more serious challenges from this storm. Like the taxis out of the airport during that big Thanksgiving blow a few years back, bad weather is the particular period when we NEED mass transit. (And to that end, proper sanding of the mass transit streets makes it particularly helpful to the car-full among us - we know the bus routes, and can figure that they should be clear as well). And the airport - the huge numbers stranded shows once more the challenges of the hub airport system. When something goes down, it if reaches the heart of the system, the entire system collapses. And lastly, the meteorologists. Let's be honest, the timing of these storms were late from the start, causing advanced panicking and letting people's guards down for when the storm finally rolled through. The local weather predictors were about a day off, from the initial dusting of snow (way back on the 13th, which was supposed to be on the 12th), to the post-Christmas warming trend, we were literally a dollar short. But in general, it has been a survivable malady that struck the Sound for most. I have packages still to arrive and comics have been help up in Oregon for over a week, but in general it has been pretty good. And now we are back to Seattle Winter - grey-skyed and damp. But then, maybe we'll get snow again. There is always hope. Each year, the Lovely Bride and I celebrate the holiday by having friends over for dinner, a feast with brined turkey as its star. This turkey is so good, that even the recent absolutely miserable weather was not sufficient to dissuade them from at least attempting the quest up to ice-clogged Grubb Street, on the east hill near Panther Lake. One of our number could not make it, her car still snowed in on Queen Anne. A family of three managed to get out of their garage in Kirkland, but the street proved to be too difficult to navigate (And I hope they got the car back into the garage afterward). One guest may or may not have damaged his radiator in the journey. Two guests had to be picked up, their house in an unplowed cul-de-sac at the bottom of a hill. The final couple made it with no problem, as old driving skills honed in Illinois winter came to the fore as they braved the ice floes in front of our house. The Wet Christmas promised by the forecasters? Bah humbug. It only stopped snowing once the successful members finally arrived. Even with our reduced numbers, it was a wonderful meal. The turkey (a 21-pound moa brined overnight) was done to perfection, and accompanied by poppyseed rolls, stuffing, gravy, two types of peas, stuffed mushrooms and ramaki (bacon-wrapped scallops and olives) as appetizers, and cheesecake and chocolate cake (with wonderful tea) for desert. Conversation was engaging and ran late into the evening (possibly the result of the wine, but just as likely from the fact that all of us had been dealing with cabin fever over the recent ordeal). Everyone got home safely afterward, which was perfect. And the promised rain? Still hasn't shown up here - it is still snowing as I write this. May all of you, and all that are close to you, have a safe and sane holiday season. From all of us at Grubb Street, we wish you a happy holiday season. Peace on Earth, and to all men (women, children, cats, and santa-hat wearing dragons), good will. So yesterday I was snowed in, and took some pictures of the surrounding snow. One of the pictures in particular was interesting in that it was a pileated woodpecker, a truly beautiful bird, perched across the street on a power pole. Here's the shot, from the safety of my own home. And about two hours later a neighbor knocked on our door. He's renting the place behind one of our neighbors, and was concerned about the power pole falling over. It seems our woodpecker bored a hole eight inches deep, fifteen inches long, and four inches across. Now, on one hand I know as a former civil engineer that even a hole this size is unlikely to cause a collapse. On the other hand, its been 25 years since I've been an engineer, and we DO get high winds up here, so a big gouge in a power pole is not a good thing. So I called into Puget Sound Energy and reported it. I apologized to the nice woman that I realized that there were real power outages but I would feel particularly foolish if I let it go and then the thing collapsed, kicking off a real power outage. She laughed and said she was never surprised by those mother nature animals, and in the end we put it in the miscellaneous category for investigation. And the bird? He's back this morning, working on the OTHER side of the pole. Obviously he's some kind of saboteur. Just because I grumble about how Seattlites are shocked, simply shocked, whenever we get snow, even I am aware of how tough the situation has gotten. The Puget Sound region has had either three or four (depending on how you're counting) "snow events" in the past two weeks, without any warming trends between them. The most recent of these events hit yesterday, and was supposed to be mostly rain in the lowlands. At the moment we have 8-10" up on Grubb Street, and so I am working from home today. Yes, this would be considered "real snow" to anyone back east, Seattle. You are completely justified to be amazed and/or to complain about it. Go nuts. Actually, we have it very nice here. Power is still on (touch wood again), we had sufficient supplies laid in (and shopping Sat. AM was filled not with panicking customers but with families preparing for Christmas dinner), and through the miracle of the Internet I can communicate with the home office (which sounds a bit sparse today - one fellow employee made it all the way to the office, only to get stuck five feet from our under-building parking - even if you can make it on the roads, the parking lots are horrible). And we are much better off than many. A lot of folk don't have the luxury of a snow day or even working at home. The local merchants are struggling both with personnel that might not show up and customers who are aren't coming in. And the airport is a disaster that shames the Thanksgiving storm from a few years back. No one is going out, flights are being canceled, no one has de-icer (yeah, that's a surprise) and families are literally trapped at the airport for days. So yeah, I'm pretty thankful to be where I am right now. The predicted weather has been severe but not as horrible as predicted (touch wood). The heavy winds kept to the uplands, sparing most of us and leaving the power on despite some local outages. The roads are snow-covered, and we have had about three inches on Grubb Street(and the snow has kicked up again). It is a light, fluffy, dry snow, so it blows about easily and I am not sure about real totals at this point. We had an overnight guest from the Lovely Bride's RPG group due to the snow, but sent him on his way this morning with minimal fuss. And while there have been traffic tie-ups and frustrations, we've gotten off easier than other places in the recent storm (Portland is requiring chains in the metro district). I should note that Seattle's weather is extremely localized, and can change dramatically over a course of a mile. Some of the other reporters have been Scarlett and Mystical Forest. Also, one of the greatest dangers I have encountered on the road so far has not been bad drivers, but snow chains that have come off cars, trucks, and busses. Keep an eye out. More snow tonight. Everyone stay put, and we'll see how things turn out tomorrow. OTHER PERSON: This is the worst weather we've ever had. ME: You remember that Thanksgiving storm two years ago? OTHER PERSON: Oh, yeah, that was bad. ME: And the one in January right after that. OTHER PERSON: Yeah, that one was a bad one, too. The fact is there in their brains - we have had bad weather here before. But we FORGET. And are rudely interrupted when it snows again. Our temperate nature 90% of the time makes this sort of thing amazing to most people. And when we have thunder, oh, that's a subject for discussion the next day. People from the Midwest must think we are well and truly addled out here, to report on snow EVERY TIME IT HAPPENS. A blog out of Wisconsin would read "Snow. Snow again. Yet more Snow. Ice. Thundersnow. More Snow. It's spring again, and Mr. Coleson lost his ice-fishing truck when the lake thawed. Oh, wait a minute, more snow." On Grubb Steeet, things have not been too bad. The most recent storm laid down most of its damage north of I-90, and Bellevue was a mess, but to the south we just got a light dusting and slick roads. Thursday work was canceled, Friday the place was open but lightly attended between Christmas vacationers and those truly snowed in. There were about five people in our 15-person office pod, one of the founders was running the front desk, and they set out for pizza for lunch. Those who showed were individuals with significant Northern/Eastern Washington roots. And the only reason we managed to show up was that our office is not located on one of Bellevue's many unplowed hills. So now we have another storm bearing down on us. High winds are predicted in the foothills but haven't descended on us, yet. Snow ranging from trace amounts to thick blankets should arrive later. And it should continue like that through the holidays. The Lovely Bride and I did our holiday dinner shopping today, capped with a 21 pound bird, and we're ready to hunker down for a while. I've said this before, but the big challenge to weather prediction in Seattle is the lack of a large, flat agricultural state to our west. If we had one, we could call it up and ask "What is all y'all's weather like over there?" and they would tell us and that would be the likely forecast. Anyway, Wednesday morning was supposed to be a massive snowpocalypse (I did not coin this eminently useful word, but my IT department thinks its a hoot). Supposedly we were going to see the nastiness descend on Seattle proper with all manner of dire consequences. 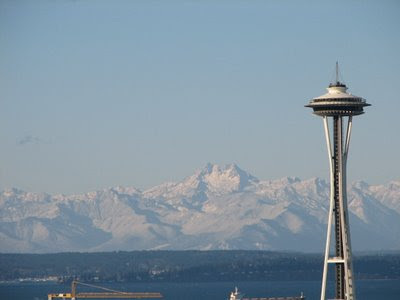 Instead, what happened was that the Olympics (see glacial wall photo below) blunted the most of the snow assault, so Oly to the south and Everett to the north got hammered, while the angel of snow passed over Seattle. Of course, it left nervousness in the office on Wednesday, and most of us kept the weather radar on the computers running while doing other things (which harks back to my days in Wisconsin, where I would leave the TV on without the sound, tuned to the weather channel, for the inevitable line of summer thunderstorms). When a particularly nasty cell of snow moved over Renton, I booked. Got home in the wet but before dark, and nested in. So, crisis averted? Not quite. The center of the storm moved south, and Seattle came in for its licks THIS morning. They closed the office officially when it was noted that Bellevue was suffering a complete white-out. Up on Grubb Street, it is a half-inch dusting, but with our treacherous little hill, there is no traffic. So I'm hunkered down, VPNed into the network, office communicator on, checking emails as need be. Sent enough work home to keep me busy through the day. But the weirdness of the weather is like the frustration of the traffic - it is not that it is all that bad, but that it is completely unpredictable. Despite our best level of meteorological disbelief, the snow has remained on the ground and the temperatures have been surprisingly arctic. While the main roads have cleared up, the street I live on (with its slight rise in front of the house) have remained icebound and treacherous. The good news is that the views have been wonderful. Coming off the hill yesterday, the Olympics were clad in white and looked like an advancing glacier bearing down on the sound. Now word comes down of heavy snow, starting early and going through the day. I've loaded up files in the laptop in preparation of working at home tomorrow. I mentioned our very-Seattle affliction of meteorological amnesia in regards to the Sound's High Summer, and now I should revsit it with our regions' first snowfall. It has snowed every year I have been out here on Grubb Street, ranging from light dustings to real snow accumulations that close schools. Yet we forget about this, and with the first real snowfall of the year, we both treat it as Snowpocalypse (TM) or and then forget entirely what we are dealing with once it is on the ground. The dreaded snow event was supposed to hit Friday night, and everybody panicked at the idea of being caught in rush hour under six inches of snow. 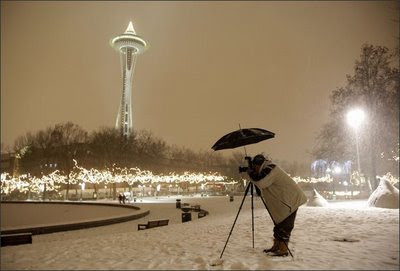 Given the accuracy of Seattle weather reports, it put off until late Saturday night, consisted of less than two inches, and the only effect was to curtail my Saturday Night game to three hours as the lawns and parking lots filled up with snow. However, combined with the pre-snowfall panic, there is the post-snowfall willful ignorance. King County doesn't have same level of salt trucks and plows that other communities have (odd, since we can see the snow year-round on the surrounding mountains). So unless the snow is followed by warming temperatures (it ain't this time), the streets turn to polished glass. We have a very slight incline on the street in front of the house, and it has been enough to defeat all but the pickups on their way up the hill. We hear the spinning wheels and watch the slow slippage backwards in defeat. No one thinks we have a hill here until it snows, and then they are heartily reminded (A few years back the county filled in the ditches by the side of the road and put low-level sidewalks in, which have reduced the number of cars ditching this year). So we are effectively snowed in for the day, and there are predictions of an additional 1-2" this afternoon (the skies are blue at the moment). So its a day of working at home, cleaning, and Internet shopping. It might be irritating, but it is just so PRETTY outside right now. With an economic downturn, there has been a sea-change among corporations in their struggle to remain afloat. The traditional approach to bad business news has been the was WotC/Hasbro handled its layoffs - stern, tightly written letter from the management that minimizes and regrets the loss and reassures that this is just a small matter in the larger and greater triumph of industry. But as everyone from the NFL to NPR is laying people off and cutting back, a new mood of bold and heroic desperation is taking hold. Now there are no regrets but rather a focusing on how brave and honest the corporates are too be taking these strong, determined actions in these horrible times. We should be appreciative we have such wise captains of business to see us through as they throw children off the sleigh to the pursuing wolves. This is particularly true over at the Seattle Times, whose not-so-slow diminishment I have ended up chronicling as a consumer. Previously the editorial page was butchered and the Business happy-news tucked into the main page. Now the local reporting and the entertainment/modern living/comics section saw a space-time collapsing into a single section. Said collapsing has all the elegance of two freight trains slamming into each other, and there were casualties. The NY Times crossword was banished to online. The macabre Lio, urban Candorville and innocuous On A Claire Day comic strips were pushed into shallow graves. The Wednesday recipes are no more. Celebrity gossip now has to compete with local politics (and sometimes wins). And this was heralded by a full column running for a week detailing the changes, and a declaration that they are trying to reduce their two biggest costs - newsprint and manpower. In other words, product and content. Isn't that what I'm paying for in the first place? The stuff that brings my eyeballs to the paper which the advertiser pay for? I'm not here for the ads from Fry's, folks. I think that all businesses will evolve over time, I refuse to give those in charge a cookie just for being so forthright as they slice away from their very product they are selling in order to survive. Triage is necessary, but not heroic. Yesterday was Sacnoth's 50th birthday, and he and his bride invited us to dinner with the Monkey Kings at a place in Burien called Bistro Baffi. And it was a very good meal. I had not been to Burien since Wonder World had been claimed by gentrification, but we found it with little problem. The restaurant itself is tucked into the corner of an unlikely-looking strip mall, but once inside it is a nice-looking place. Most of it is intimate tables and a small bar, but with our bunch (an eight-top, including the Lovely Bride's mother and Little Elf Hat), we took over a back room, apportioned with original art and cases of wine. The last is a bit of irony, in that Sacnoth is an avowed tea-teetotaler and self-described prohibitionist (though a tolerant one). Each of us took a pledge to abstain in respect to his day, and, as his wife noted, both the party and the wit was dry. So we were surrounded by wine without a drop in our glasses. The food, on the other hand, was plentiful and wonderful. I think we strained the small kitchen in that the pacing was leisurely, and my saltinboco had been warming in the oven as the final pastas were prepared (the cue is a very, very hot dish at the table). But the taste was well worth the wait, and in the meantime, they served up some peppery polenta and mushrooms that were incredible. The seafood was fresh and well-seasoned and they topped off the evening with a flourless chocolate walnut cake for the birthday boy that was to die for. The wit at the table was dry, and we ran over all manner of things from politics to our daily lives to Cthulhu. Visitors to the back room included the chef (who took a well-deserved bow) and one of the artists who was showing off her work to friends. In general, Bistro Baffi (apparently named after the chef's mustache) was a surprise, and I'd like to go back, without the self-imposed declaration of temperance this time. You Can't Take It With You by Moss Hart and George S. Kaufman, Directed by Warner Shook, Seattle Rep through 3 January. The holiday season is the time for the "safe play" - the crowd pleaser, the innocuous bit of Americana, the stirring musical, the thing you can take visiting family to. And so with the more darkly aggressive boom playing in its sister theater, we have this venerable old soldier from 1936 heaved onto the holiday fire. And it is interesting because of what it says about how theatre has changed in the past seventy-some years. You notice two things - how slight the story itself is, strung through three acts, and how many PEOPLE there are. This is a WPA project of a play - 18 actors, 15 of which are Equity, a sizable chunk of them onstage at the same time that requires less of a director and more of a traffic cop. In this era of one-person shows and small productions, this is a reminder of what theater in the past century was like - big, brassy, and crowded. Sort of like experiencing a big band after years of jazz trios. The sense of scale impresses. That said, the story is slight. Young girl with daffy, eccentric family loves young boy with straitlaced, wealthy parents. It follows a three act structure - Act One we get to know the endearing wacky family and the girl's fears. Act Two the girl's fears are realized as the parents show up on the wrong day to discover the wacky family. Act Three we get the girl and the boy out of the tree, there are some good speeches about happiness and revelations pulled out of the hat and everyone goes home feeling fine. Yeah, it sounds like an episode of Monday night TV on CBS, and this is revelatory as well - much like photography removed from art the requirement to be representational (kicking off what we call Modern Art), the presence of television has removed from theater the public need for this type of story. And as a result, theater has gone in other directions, and evolved into new (and often less-mainstream) niches. But here we have a staple of straw hat and high school productions - how does the Rep handle it? Very well indeed, from the viewpoint of raw craftsmanship. The stage is a cluttered, livable, open space for the cast to prowl about in. There are numerous doors to slam and chairs to lower one slowly and comically down upon. The pacing is also great, with flurries of activity scaled down to personal moments. And the cast is throwing as many comic flourishes as the audience can handle. The actors also bring more to the table, and their characters, even though created with the broadest of brushes, are invested with more depth than you get from the standard staging. Young Male Ingenue (Ben Hollandsworth) summons the spirit of a young Jimmy Stewart, Young Female Ingenue (Elise Karolina Hunt) is equal parts of love and embarrassment for her family comes through, and the incredible flurry of the family works. Everyone gets into their character - so much so that at one point, Grandpa's dart-playing finesse (a bit of business from Michael Winters) upstages the lines of the Russian Revolutionary Dance teacher (Farnk Corrado) (a slip-up in an otherwise effective handling of all the stage business and keeping the audience focused in the midst of the controlled chaos). But in the end, we have resuscitated and reanimated a beast from Broadway's past, a bit of nostalgia, lacking any deeper message, well produced but as slight as an ingenue's smile. By the same token, they were playing for a full house, so they might just be on to something. And while I've been busy elsewhere, the city of Kent has moved forward to take over my neighborhood. I've mentioned this before but let me back up for those who don't want to dig through the files. I live in the Panther Lake neighborhood, so named for a good-sized lake on the east hill of the Green River valley (also called Benson Hill). When we moved in some ten years back, it was part of "Unincorporated King County", which meant that no local municipality claimed us for services like trash and police proteciton. There are a lot of pockets like this all around the county, as the various smaller towns and cities have set up their borders, and pieces get left out. Now, the current King County administration has been encouraging the smaller communities to pick up the spares, and I've talked about Renton swallowing the Fairwood neighborhood just north of our place. Our chunk of the woods was slotted to be swallowed by Kent (indeed, we border on a Kent district school), but things have been kinda quiet on that front. No more. Kent has pressed forward on the matter, and established a web site with the general information and a pretty thorough FAQ on what's going to happen (which, um, isn't accessible at the moment, but I'll post it when its back). And it pretty much addresses my questions (Taxes will be about the same, they will increase their police budget to handle us, we can keep the septic system as long as we keep it in good repair). I'm pretty solid with the idea - if anything, I would have preferred to see annexation BEFORE they started a half-dozen housing projects in the region (which will now be grandfathered in). Not everyone is so copacetic. There's a nearby casino/card room, perched on a low hill overlooking the Panther Lake Elementary school. It is a squat, shutter-windowed bunker that was at one time a more-appealing pizza place when we moved in. Casinos are legal in Unincorped King (I assume that it is the required number of paces away from the school itself), but are not allowed in Kent. So the casino owner wants to be grandfathered in as well, which doesn't sit well with the Kent fathers (oddly enough, the casino's corporate HQ is in ... Kent! I guess they like the neighborhood). Numbers: The current totals for the most recent WotC layoffs range between 20 and 25, all unofficial. Even those numbers are suspect in the modern era, as they may or may not include eliminating positions they were going to hire for, as well as shedding temps who up until that moment were treated just like regular employees until their contracts evap. So even a number, or a percentage, doesn't tell the full story. Names: WotC also isn't passing out any names, which makes sense, though I disagree that it is to spare the feelings of the newly-unemployed. I mean, if you really worried about their feelings, you wouldn't have fired them in the first place. But it does make sense to leave those affected the choice to come forward as they see fit to note that they are starting a new era of their life. I mentioned Julia only because her husband posted accordingly. Dave Noonan, a brilliant designer, also stopped in at ENWorld to thank everyone for all the fish. But it does create a ghoulish version of "Where's Waldo" as emails cross to make sure that friends still in the building ARE still in the building, as well as posts on the net as lists are compiled (the partial one for WotC that is currently rocketing around the net has its origins in a competing company head who knows many of those affected). It is just as bad for those people still working for the company. Lacking a firm statement and body count, employees will now be committing the business faux pas of going to look for Bob in accounting, only to find that Bob was laid off four days ago - way to open up those old wounds, friend! Martyrs: On thing that also happens in layoffs are the martyrs - those that step in front of the line to be hacked. This may be through a desire to do other things, or to protect people who are still there, or even a feeling that, even if they are safe this layoff, they hear heavy footsteps. No idea if there are any martyrs in this group, but it is always a potential. Here's a martyr story from the olden days of TSR, about 1983 or so. At one point we had five designers, and the decision was made that we had to have four. The designers at the time were Me, Tracy Hickman, Zeb Cook, Doug Niles, and Bruce Nesmith. Each of us believed that we were to be asked to Pack Our Knives and Go. Bruce, who had originally came in to work on one of our computer game experiments, went to the brass and said "Hey, I have marketable skills (I can program), let me take the hit". He stepped in front of the unemployment bullet and since then has indeed done well for himself at Bethesda on projects like Oblivion and Fallout 3. Apologists:And this is the only part that cheeses me off about public discussions of layoffs - there always is some clown on the BBS who takes the position of "Well, it's not Big Company's fault - they have to make a profit and stay in business, so their needs are more important than their employees." These guys always sound like a battered spouse making apologies for an abusive partner. I swear, if I am ever brought up in a court of law, I want these people on the jury - "Well, it's not really His fault - he had to make a profit, so naturally he knocked over ten banks. His needs are more important than the surrounding community". The Living Will Envy The Dead: A lot of attention is usually extolled on those who departed. but a harder situation is posed to those left behind. Usually the work load does not change for the employees, and suddenly a group of 20 is doing the jobs of 25. The platitude of the 90s was "Work smarter, not harder", which often resulted in the smarter survivors updating their resumes and moving on soon after (there is usually a secondary bump six months after a major layoff of people who were left behind but have found other exits). And a final word on managers. While getting laid off should not be considered a sign of personal failure for those affected, the managers that have to do the layoffs, in my experience, take having to let people go AS a personal failure. They have access to a higher level of choices than their subordinates, and feel that if only they had done something better, they would not have to layoff talented people. I have been laid off by people who felt worse about it than I did. I have seen managers resign rather than lay off people they feel they should protect (another version of the martyr). 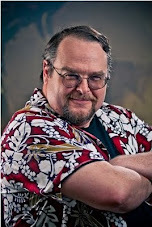 When WotC had the first their first layoffs (before I joined, when they grew too fast in their initial success), they held a memorial service at the Mana Pool in the center of the building complex, and the President of the company was there as they sailed paper boats with candles into the pool in memory of those they had to let go. Layoffs - short form, they are not fun, but then they are not supposed to be. If they were easy it would happen much more often than they do. I may be the last person in America to do so, but I finally filled up the tank of the Insight with gas under two bucks. That's a downside of a fuel-efficient hybrid, but one I'm willing to live with. Gas prices have been moving downward throughout the summer, affected by mysterious forces that us mere mortals cannot understand. Despite a major hurricane hit in the Gulf, they continued down, and continued to plummet even after the November election. When the prices were going up, there was always some storm, war, or general excuse to the excessive prices. Now that prices are sinking, specifics are avoided, and the plummet seems to be treated as proof by the media of how bad the economy is. Yes, this is this year's fashion for economic reporting - falling prices are bad news. Now you can fill your tank, but look at all the collateral damage! The economy is tanking worldwide now. Alaska can no longer pay people to live there. Alternate energy sources are now hampered because they are too expensive. This, by the way, is Grubb's Law of Economic Reporting: Whatever happens, it is bad for YOU. In front of every civil lining is this big dark cloud. Of course, now is a good time to revisit all the excuses made before and see how the situation has changed to make this price-plummet happen. The Mideast remains as unstable as a breakfast burrito topped by two diet cokes. The gulf continues to churn out hurricanes. Peak oil has still peaked. Demand has not evaporated. Yet gas prices have continued to tumble. Of course, it could be that prices were set not so much from supply and demand but from consumer panic and corporate gouging, and the gas giants have finally run out of mattress space to stash their profits. Or have seen the effects of their profits ricochet through the rest of the economy in higher prices for, well, everything. But that would just be cynical. Better to tank up and feel guilty that your modest bargains are a reflection of a wounded economy. Hope you're happy.